One day in March 2011, cars carrying investigators from Korea’s anti-trust regulator pulled up outside a Samsung facility in Suwon, about 25 miles south of Seoul. They were there ready to raid the building, looking for evidence of possible collusion between the company and wireless operators to fix the prices of mobile phones. Before the investigators could get inside, security guards approached and refused to let them through the door. A standoff ensued, and the investigators called the police, who finally got them inside after a 30-minute delay. Curious about what had been happening in the plant as they cooled their heels outside, the officials seized video from internal security cameras. What they saw was almost beyond belief. Upon getting word that investigators were outside, employees at the plant began destroying documents and switching computers, replacing the ones that were being used — and might have damaging material on them — with others. A year later, Korean newspapers reported that the government had fined Samsung for obstructing the investigation at the facility. At the time, a legal team representing Apple was in Seoul to take depositions in the Samsung case, and they read about the standoff. From what they heard, one of the Samsung employees there had even swallowed documents before the investigators were allowed in. That certainly didn’t bode well for Apple’s case; how, the Apple lawyers said half-jokingly among themselves, could they possibly compete in a legal forum with employees who were so loyal to the company that they were willing to eat incriminating evidence? Samsung executives say that the pattern of suit-countersuit criticized by some outsiders misrepresents the reality of the company’s approach to patent issues. Because it is one of the largest patent holders in the world, the company often finds others in the technology industry have taken its intellectual property, but it chooses not to file lawsuits to challenge those actions. However, once Samsung itself is sued, the executives say, it will use countersuits as part of a defense strategy. Eichenwald’s is the best overview of the Apple-Samsung rivalry I’ve seen; nothing else even comes close. A federal jury in the Apple-Samsung case delivered a mixed verdict Friday. The panel ruled that various Samsung products infringed on two patents that Apple had sued over in its latest patent case and found damages on a third patent, awarding more than $119.6 million in damages. However, it found Apple did not infringe on two other patents and also awarded Samsung $158,400, saying Apple infringed on a Samsung patent. It was never about the money for Apple. Even if Apple had been awarded the full $2.2 billion it asked for, the truth is that’s just not that much money in the grand scheme of the post-PC market. But $120 million? That’s chump change to either company. 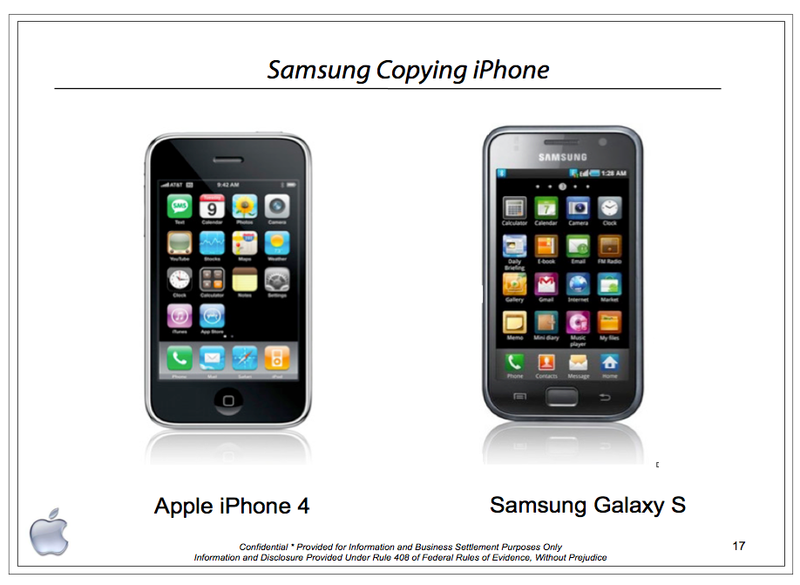 It’s hard to see how anything related to this verdict would give Samsung pause before copying Apple in the future. The financial penalty was a mere pittance, and in terms of public perception, they clearly had no shame to begin with. That said, I still don’t think Apple has any regrets about pursuing this case. It’s about the message it sends to all competitors, not just Samsung: We are irrationally protective of our work, and if you wrong us, we will go after you. Fascinating email from Jobs to Phil Schiller, entered as evidence in the latest round of the Apple/Samsung patent trial. Makes me wonder, again, whether this legal fight is worth it for Apple. Far more of Apple’s internal dynamics have been revealed through this lawsuit than through unauthorized leaks in the past few years. It does go to show, though, that Steve Jobs was keenly aware of Apple’s competitive shortcomings. They never show it in public, which leads some to perceive the company as more arrogant than it actually is, and perhaps even out of touch. Recode has a few other interesting documents and emails that have come to light through this legal battle, but none are as interesting as this one. Bloomberg Businessweek is running a feature piece on Noreen Krall, a patent litigation expert hired by Apple in 2010 as Steve Jobs was about to wage a “thermonuclear” war on competitors in the smartphone space. A New York native, Krall was actually trained as an electrical engineer, Bloomberg reports. She has two daughters in college pursuing engineering degrees, and her career is on a roll. After managing portfolios of tens of thousands of applications for the likes of IBM and Sun Microsystems, Krall took on an even tougher job – Senior Director of IP Law and Litigation at Apple Inc. Already an expert in what she was doing (mainly suing other companies for IP infringement), Krall has developed “an almost paranoid capability to see ahead and around corners,” according to Mark Chandler, general counsel for Cisco Systems Inc. and an acquaintance of Krall’s. She’s now a familiar face in courtrooms around the world. As Apple’s chief litigation counsel, the high-point of her career came with Apple’s victory against Samsung on Aug. 24, when a California jury ordered the latter to cough up more than $1 billion (€800 million) for infringing patents owned by the Cupertino giant. The story also reveals that Krall sent a note to junior members of the team thanking them for their hard work even before the verdict came. (Reuters) – Google Inc Chief Executive Larry Page and Applehave been conducting behind-the-scenes talks about a range of intellectual property matters, including the mobile patent disputes between the companies, people familiar with the matter said. Page and Cook are expected to talk again in the coming weeks, though no firm date has been set, the sources said on Thursday. One of the sources told Reuters that a meeting had been scheduled for this Friday, but had been delayed for reasons that were unclear. I’ve seen a number of comments around the Internet about how Apple didn’t exactly go “Thermonuclear” in its win against Samsung. There’s an important point to remember — Steve Jobs wasn’t talking about Samsung, he was talking about Google. In Walter Isaacson’s book Jobs recalled a meeting he had with then Google CEO Eric Schmidt. Is Apple’s victory over Samsung the end of its Android litigation, or the beginning? The bigger potential target: Google. There is no way to interpret this as anything but a sweeping, definitive victory for Apple. The company spent most of the past month telling the jury that the iPhone was a revolution five years in the making, and that Samsung had taken just three months to copy it, without bearing any of the costs or risks involved. The jury clearly agreed — and most importantly, the jury agreed that all of Apple’s patents are valid, even after Samsung spent hours trying to demonstrate prior art. Steve Jobs: Boy have we patented it.